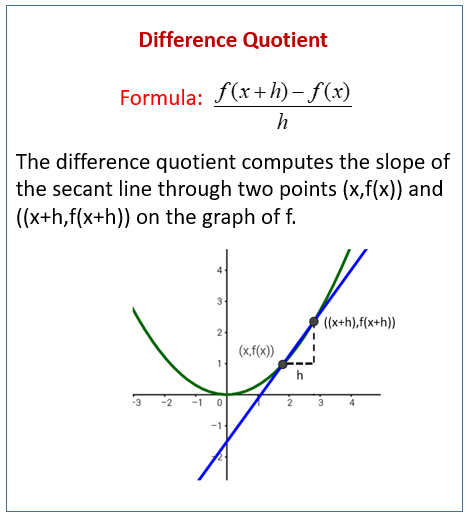 Examples, solutions, videos, worksheets, games and activities to help PreCalculus students learn how to find the difference quotient of a function. The following figures show the Difference Quotient. Scroll down the page for examples and step by step solutions. How to find the difference quotient for a linear function? Find the difference quotient for f(x) = 2x - 5. How to find the difference quotient for a quadratic function? Find the difference quotient for f(x) = x2 - 3x + 4. Find the difference quotient for f(x) = 3x2 - 5x + 2. This video gives the formula for the difference quotient (aka, the subtraction fraction) and does a couple examples of finding it for different functions.